Let's face it, we're one of the few cities in India that you can have hot chocolate without worrying about soaring temperature, any time of the year. Whether it's the chilly winds of the winter, the cold of the monsoon or the breeze during summer, somehow, hot chocolate doesn't seem out of place in Bangalore, any time! So if you can’t be bothered to make some hot cocoa at home, then just head to these cafes and eateries that offer everything from the standard versions to sinful affairs such as a those perked up with nuts, spices, and plenty of whipped cream. The steaming mug of hot chocolate here is as thick as it gets. The perfect combination of gooey cocoa, steamed milk and sugary sweetness, this is one mug (pick the jumbo size) you might want to nurse on a cold, cold evening. The outlet on Primrose Road even has hot chocolate shots! Yaaas! The hot chocolate here is made out of Hershey’s cocoa and chocolate syrup and is a harmonious mix of milk, sugar and cocoa with some extra chocolate sauce. Add a swirl of whipped cream and a sprinkle of cinnamon, and you are set! At this chocolate cafe, the selection of hot chocolates available are purely made out of rich, thick molten chocolate with some flavour additions and nuts. Their Dark Chocolate is just that: pure, dark chocolate. Other combinations include dark chocolate with almonds (roasted and caramelised), cashews, and cranberries. Caramelised hazelnuts and almonds pair up with white chocolate to create other sinful, hot combinations. The Mexican Spiced Hot Chocolate at Chinita is a winner, especially during winters. Because not only are ingredients such as milk, cocoa and sugar warming for the soul (you can’t go wrong with these ingredients), but the addition of cinnamon adds a lovely aromatic punch to the hot chocolate. The Pure Hot Chocolate at Cafe Max is just molten chocolate, lots of cream and some milk, heated together to create a gooey, messy, and sinful hot drink. Their selection of Spanish hot chocolates has us salivating. Take your pick from Classic Spanish, Aztec (with chilli), Hot and Cold (with chocolate ice cream), Madrid Mocha (thick dark chocolate with espresso), Avellena (with hazelnut) and Mint Magnifico (with mint). There’s also whipped cream, marshmallows and churros to go as extras along with your hot chocolate. On a day when you don’t feel like guzzling endless cups of their caffeine, try the Signature Hot Chocolate at Starbucks, a combination of four kinds of cocoa and steamed milk, topped with whipped cream and sprinkled with chocolate powder. Starbucks also has a version with white chocolate and milk, and there’s also one for the little tykes with steamed milk infused with mocha-flavoured syrup, and topped with a swirl of sweetened whipped cream. Rich cocoa stirred in with steamed milk, topped with dollops of whipped cream and finally garnished with chocolate shavings – this is what the Hot Cocoa at Matteo Coffea looks like. Plus, it tastes really thick, creamy and delicious too. They have five kinds of hot chocolate on their menu including sinful Classic Belgian versions with milk and dark chocolate. Other flavours included a spiced version and a hazelnut one, along with a rich Dark Chocolate Cafe version. Head to ITC Gardenia to check out the company’s Fabelle Chocolate Boutique. Along with chocolate bars and bites made from cocoa sourced from all over the world, chocolate cups, pralines and iced chocolates, these guys also do hot cocoa with really exotic ingredients and additions. Start with their Sao Tome Classic Hot Chocolate, which includes fruity notes of single origin, 70 per cent dark chocolate from Sao Tome, with hints of Madagascar vanilla and Sri Lankan cinnamon, all topped with whipped cream and cocoa nibs. The Milk Cocoa comes with chunks of pistachio almond nougat and a Spiced Hot Chocolate with 67 per cent dark Madagascar chocolate, is perked up with an Indian spice mix and topped with decadent truffled French Chantilly cream. Apart from their bakes and signature dishes and sinful desserts, their hot chocolate comes in a large bowl (drink with both hands to feel really cozy) sized cup in either their signature hot chocolate, that's classic chocoholic fuel, or the hazlenut version for when you're feeling slightly more indulgent. Their special hot chocolate mix made in house will have you grinning with the first sip. Rich and generous with the coco, the hot chocolate is perfect for the vibe of the place. 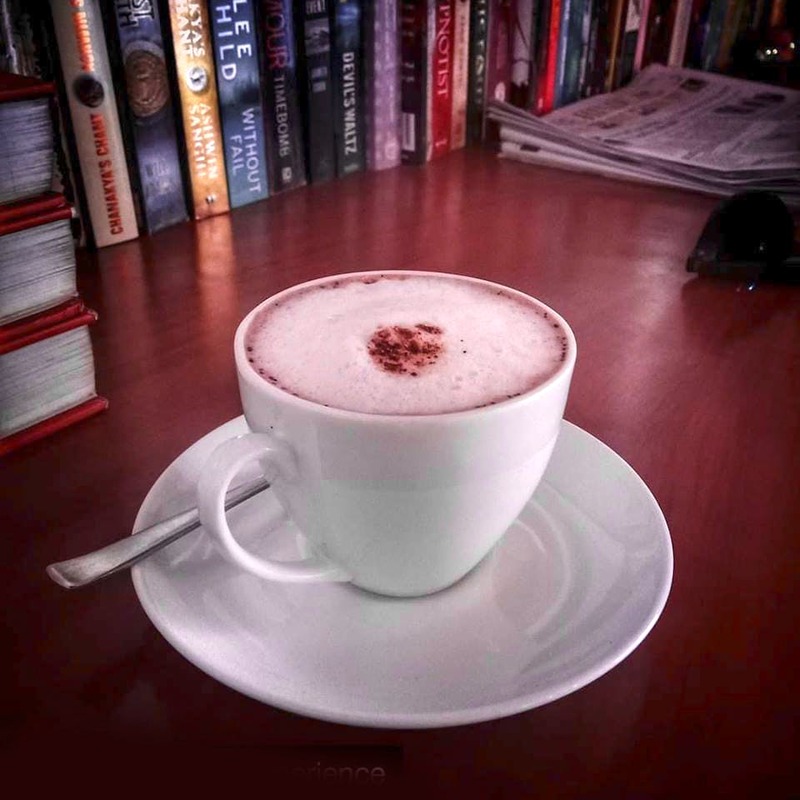 DYU's idyllic space will have you wanting to sit with bae, or by yourself sipping one one of their hot drinks accompanied by the dessert or a book.